After me waiting for a while I finally went to the cinema to watch the second adaptation of the best-selling series by Rick Riordan, “Percy Jackson & the Olympians,” which sends the already familiar characters from the first movie along with some new ones on a journey to the mythical Sea of monsters , known to mortals as the Bermuda Triangle. The director of this movie is Thor Freudenthal who replaced at the director’s seat Chris Columbus and again starring are Logan Lerman, Brandon Jackson, Alex Daddario and Jake Abel. where the sequel is better than the original, even though at least in books it is not such the case. Thor Freudenthal and the screenwriter Marc Guggenheim have done great with the difficult task to create an adequate continuation for the first film, but I think that this one is closer to the books. I think in the perfect experience for those who love mythologies. The special effects are outstanding and not step back on anything seen in much more expensive films released recently, and the actors… well, the actors. Logan Lerman confirms his place as one of the most talented young actors today and enters entirely in his character, conveying both his characteristic sense of humor and the inevitable doubts for his age in himself. Against him more than worthy stand the visibly grown and become much more respectable as charisma and presence Jake Abel, creating a credible, frightening image of an embittered and increasingly mad Luke Castellane. Clarissa to look cool. On their background Alex Daddario and Brandon Jackson have less screen time as Annabeth and Grover, but it is done with the maximum use - Alex gives more emotion and vulnerability to Annabeth, who was made too big of a tomboy in the first film , and Brandon is still fun especially in the famous scene in which he is with a wedding dress. The older dogs of the actors are not to discard I think, and although I think Anthony Head can not replace Pierce Brosnan as Chiron , Stanley Tucci compensates for that with his wonderful performance as Dionysius. that the effects are very good , with a clear evidence of this are the many creatures that are seen - from the mighty Colchis bull in the amazingly beautiful hippocamps and the repulsive Manticore and Polyphemus and finally the formidable ancient enemy that Luke was able to rise from the dead with a glitter reminiscent of Balrog from “The Fellowship of the Ring”. All this is spiced up with good dialogues that truly made me laugh and I think are garnished with a lively music by Andrew Lokington. The upshot of all this I think for me is the perfect fantasy movie - beautiful, bright, with amazing adventures, humor and even a few touching moments with beautiful lesson binding on each story. I am happy I managed to watch it in cinema. This is clearly a movie for the kids and preteens, but really even as I am an adult, I kinda enjoyed this movie so much It was fun and I looked forward to whatever the sequel this movie has. Yes, it is for kids and preteens, but in spite of that it was fun to watch, as you noted. Logan Lerman confirms his place as one of the most talented young actors today and enters entirely in his character, and you made this in to a great review. 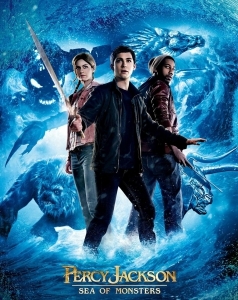 I have seen Percy Jackson Sea of Monsters and in reading this review, it brings to light the fact that I am most certainly going to see it again.